Leptin Weight Management Dried Plum is teemed together with the effective ingredients extracted from the edible herbal plants such as Yunnan Puerh Tea, Lotus Leaves, through ultra-low-temperature extraction, then by scientific combination, inoculate the special microcapsule active lactobacillus, using dried plums as the carrier, the end result of our process is a natural, healthy food without any chemical agents. 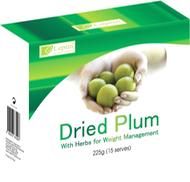 Weight Management Dried Plum can be eaten straight from the pack. DIRECTIONS: May be taken once each day or as required, open one bag and consume contents after the main meal of the day. May be kept chilled or frozen as per the consumer's taste preference. Must be chewed in small bites and the husk/seed expelled.